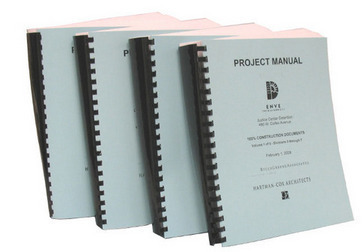 Project Manuals can be printed in black & white, color or mixed. We can print single-sided or double-sided depending on your needs. Sizes are 8.5x11 & 11x17, the 11x17's can be Z-folded to fit into the book. We offer plastic comb binding to bind your manuals. There are many different colors of paper available if you wish to print different sections on different colors.